Veteran bassist Mark Dresser was kind enough to answer a handful of our questions about his music and career. 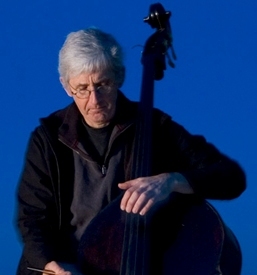 Mark has played with Anthony Braxton, John Zorn, Ray Anderson, Jane Ira Bloom, Tim Berne, Gerry Hemingway, Anthony Davis, Dave Douglas, Satoko Fujii, Bob Ostertag, Joe Lovano, and many others. You can learn more about him and his latest activities at his website, www.mark-dresser.com. You’ve spent a lot of time over the years exploring aspects of solo bass. What led you back to the group format in Nourishments? I musically grew up in the UC San Diego environment. I was a student there at three different periods (in the early 70’s, the late 70’s and mid 80’s.) I was initially attracted to UCSD after hearing the great Bert Turetzky perform. Afterwards I lived in New York City for nearly twenty years before returning to UCSD, as faculty in 2004. Since then I’ve had the pleasure of collaborating with the trumpeter/rhythmic theorist Ed Harkins, the singular percussionist and conductor Steven Schick, the Pulitzer Prize winning composer Roger Reynolds, and world renowned pianist and composer Anthony Davis. As a research university UCSD has been extraordinarily supportive of my creative activities, including the telematic music research, furthering my solo music with the 2010 production of the CD/DVD GUTS: Bass Explorations, Investigations and Explanations (Kadima Collective), and documenting other recording projects. Also I must mention the high caliber of the students who come to study UCSD. It continues to be a highly inspiring and energetic environment. In December I’m performing music from Nourishments with my East Coast quintet featuring Rudresh Mahanthappa, Michael Dessen, Denman Maroney and Michael Sarin at Firehouse 12 in New Haven on the 13th and on the 21st at Cornelia Street Cafe in NYC. On December 15th I’m participating in a telematic performance, Time Axiom: A Telematic Music Concert between musicians in New York, Belfast and Zurich. Early 2014 I have performances with the iconic drummer Han Bennink, violinist/violist Mary Oliver, and Michael Dessen. I’m also working on some new solo music and performances and a duo recording with Anthony Davis. In Spring I will be in Europe on sabbatical doing some composing and giving concerts with Myra Melford and Gerry Hemingway, some solo concerts, including the Ulrichsberg Kaliedophon, a special project in Denmark called Experimentarium led by violist/composer Marius Ungureanu, collaborations with the noted Italian bassists, Daniele Roccato as well as the German bassist, Sebastian Gramss.